Bellringer activity: Reflect and write about the current use/misuse of ideas, proof, (and value) of facts in professional publications/media today? 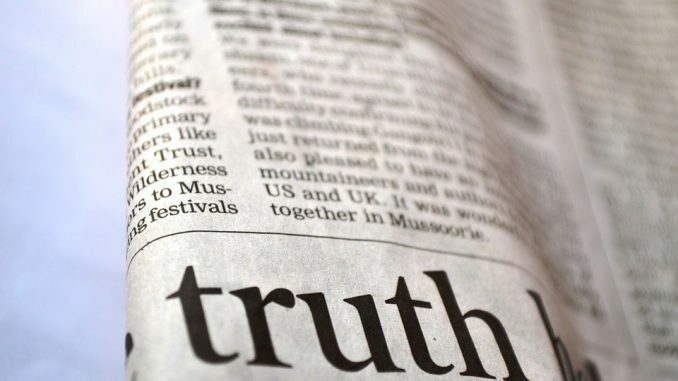 What are the current uses/misuses of facts by citizens or politicians today? In the United States today, a morning spent switching between tv news channels reveals rivaling news programs that report- and interpret- facts for viewers. In addition, Millennials often get their current events from internet sources and social media in brief ‘bites’ or commentary. Providing learning experiences that prepare youth to be critical thinkers, civil communicators, and problem solvers is at the core of 21st Century teaching and learning. The following Anchors standards focus on students’ abilities to research, analyze, interpret, and communicate accurately and effectively. Reading Standards for Informational Text (Grades 6-12)/Integration of Knowledge and Ideas – Delineate and evaluate the argument and specific claims in a text, assessing whether the reasoning is valid and the evidence is relevant and sufficient; identify false claims and fallacious reasoning. (Ohio) Social Studies Learning Standards (High School)/Topic: Civic Participation and Skills- Content Statements 3, 4, 5. – Includes evaluating media messages; how different communication methods affect how people define and act on issues; assessing how effective communication addresses diverse audiences; students identify, assess and evaluate world events , engaging in deliberative civil debate and influence public processes to address global issues. TEACHERS, PLEASE CONSIDER SHARING ANY LESSONS YOUR HAVE TAUGHT AROUND THESE TOPICS. HOW DO YOU PROVIDE LEARNING EXPERIENCES IN WHICH STUDENTS ARE BETTER ABLE TO DISCERN FACT/FICTION AND INTERPRET THE IDEAS, PROOF, AND VALUE OF THOSE FACTS TO ADDRESS CURRENT ISSUES?